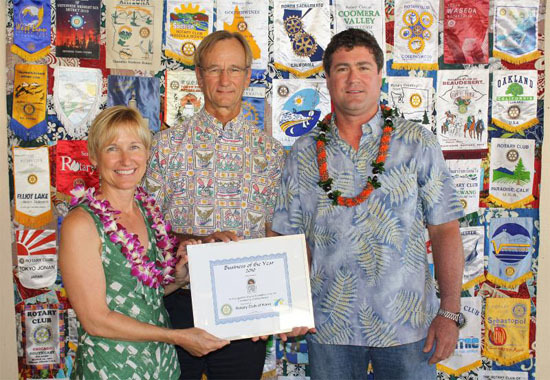 The Rotary Club of Kona has been honoring local businesses in the West Hawaii community with quarterly awards for several years. The Business of The Year award recognizes recipients for their outstanding commitment to the community. This year, the service club decided to move from quarterly awards to honoring one business that aligned with its own dedication to community service as a source for hard work and a better life in the community. Hawaii Forest & Trail was founded and is operated by Rob and Cindy Pacheco, who share their passion and knowledge of Hawaii’s natural beauty with visitors from all over the world. 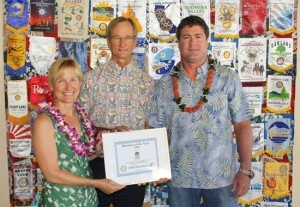 Hawaii Forest & Trail’s vision is to inspire the conservation of Hawaii’s natural resources. Most recently, Hawaii Forest & Trail Hawaii launched their new company-wide conservation initiative entitled e hoomaluo (conserve our natural resources). The program mission is to support and inspire the conservation of Hawaii’s natural resources through corporate giving, stewardship and sustainable business practices.